It’s starting to cool off in most of the country as we approach winter, but that shouldn’t mean you need to disconnect from your phone or music while on the go because of the need to wear gloves or a hat. Thanks to a deal in the DL Deals Store, you can not only keep that head and those hands warm, but you can do so while staying a fully capable tech junkie. 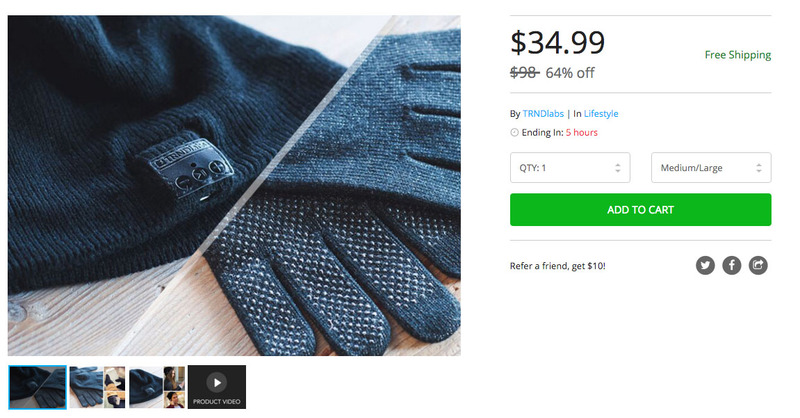 The deal is for a beanie and gloves bundle, where the beanie is Bluetooth equipped from the folks at TRNDlabs and the gloves have touchscreen compatible fingertips, along with a gripping material to prevent phone slips. The beanie is a classic black beanie, but inside you get speakers built-in where it would sit over your ears for listening to music or taking calls. It also has simple controls, 33-foot connectivity, and 60-hour standby time or 6 hours of continuous use. The gloves are double-layered and should help keep those tips warm throughout the next few months. The deal is only live for another couple of hours, so act fast.